Our laboratory focuses on the very origins of language learning. When infants hear a sentence, how do they know where one word ends and another begins? How do they learn the meanings of the words? How can parents help their children develop language? 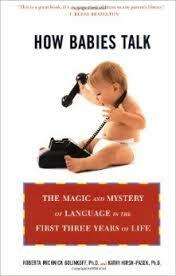 We have shared our findings and those of other researchers in the field in How Babies Talk: The Magic and Mystery of Language in the First Three Years of Life (translated into French, Spanish, Italian, Korean, and Chinese). The field knows a great deal now about how to help our children learn language and it has nothing to do with buying videos. Talking with our children and reading to them feeds their language learning machine. How do children develop spatial skills? We all use our spatial skills every day! Packing a suitcase for a vacation or reading a map to find the beach involves our spatial reasoning abilities. Early spatial skills are also related to a child’s later mathematical skills. We want to know what knowledge young children have about shapes and spatial relationships! Some of our current studies focus on what young children know about geometric forms like squares and triangles and how they develop their spatial and early mathematical skills. We are part of an effort to understand how learning begins in the STEM disciplines of Science, Technology, Engineering, and Math. What does good early education look like? Our last book, A Mandate for Playful Learning in Preschool: Presenting the Evidence (Oxford University Press) shares the research on how play and playful learning promote learning in preschool and kindergarten. For children to succeed in the 21st century, we need to encourage our children to play and our schools to teach in an engaging way that promotes what we call the 6Cs – collaboration, communication, content, critical thinking, creative innovation and confidence. What can parents do to promote early literacy? In Celebrate the Scribble: Appreciating Children’s Art (Crayola Beginnings Press), we show how play with ordinary pencil and paper feeds into the development of writing and early literacy. In our award-winning book Einstein Never Used Flash Cards: How Our Children Learn and Why They Need to Play More and Memorize Less (Rodale, 2003 – translated into Spanish, Chinese, Japanese, Korean, Indonesian and Portuguese), we describe how young children learn in a variety of domains. Our goal is to reassure parents that they can have smart and well-adjusted children without breaking the bank!